Last month, we broke down some of the best strategies for following up on your interview with a new company, and the importance of taking action even after it’s over. Catch the blog post here! One of the tools we touched upon was sending the hiring manager a Thank You note as a follow up to the interview. This week, we want to go a little more in-depth on that subject and walk you through just how simple this process can be! You’re going to have a lot on your mind in the days before your interview, but it’s a good idea to have your Thank You letter already typed out. Once the interview is over, gloss it over one last time and add in any relevant information, making sure to answer any questions that the interviewer may have asked you during the meeting. 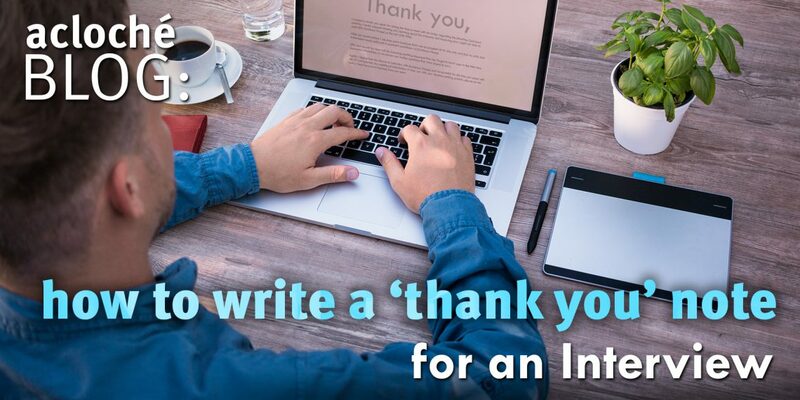 Since the bones of your Thank You letter will already have been written out, you can quickly email it to the hiring manager following the interview. This demonstrates that you are grateful for and understand the value of their time, and demonstrates how enthusiastic and serious you are about the potential position. This should be the most effortless part of your entire job hunt! The Thank You letter itself should be extremely simple, as it’s really just a tool to show that you’re mindful, courteous, and professional. Keep it brief! Don’t use this as a crutch to hit on a hundred different new talking points about your work history—that’s what the interview is for. This letter serves three basic purposes: (1) To thank them, (2) To reinforce yourself, and (3) To remind them that you’re ready for the next step. If there is something of paramount importance that you mistakenly omitted from the interview, then fit it in the Thank You letter, but otherwise, try not to introduce too much new information. I wanted to thank you again for taking the time to meet with me today regarding the [Machine Operator] position. I really enjoyed meeting you, learning about the company, and exploring how I might be able to assist [the Company Name] as the new [Job Title]. After our conversations, I am even more confident that I am an excellent fit for this role, and that my skills and experience would make me a successful contributor to [Company Name]. Again, I appreciate the chance to interview with [Company Name] and am grateful for the time you spent with me. If I can provide any additional information to help you with your decision-making process, please let me know. I look forward to hearing from you soon! Take a minute and proofread your letter very carefully before sending. If you want to explore a few more formats, here is a great resource! Remember, send this email (or handwritten letter if time permits) as soon as possible. Once the letter is sent, head over to our How to Follow Up on Your Interview blog post for a guide on the next steps to take in your job hunt process!